Beagles have often been a favourite with aristocracy, especially in Britain. So it's no surprise that Steiff's new Biggie Beagle was created as a companion to our Sir Edward Teddy bear. 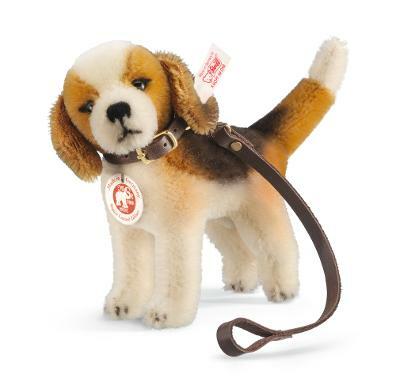 This remarkable dog is sewn from spotted beige/brown premium Steiff Schulte mohair. He is carefully painted using a time-consuming airbrush technique. Biggie wears a handmade leather collar and leash. Biggie's neck is jointed. This playful pup is just waiting to be taken on a walk. Biggie is the perfect companion for Sir Edward, but he's ready to be your best friend, too! Why not adopt him today? A bitty 4 inches in size, Limited Edition of 1500 pieces.